The reason why it is needed to hide this fact goes back mainly to the experience of the NKT leadership during their first wave of protests, from 1996 to 1998. During that time the NKT was clearly identified by the press/media as the organizers of the protest campaign and the NKT leadership and their followers didn’t deny it – though they had tried it. After the third demonstration, I strongly requested the members of the Shugden Supporters Community to stop all political activity immediately. Because I understood that HH would not accept, there was no meaning in continuing. I requested the people in Dharma Centers to forget all these politics and concentrate solely on their Dharma practice. In this way our activity lasted from May until July, only three months. This was my first experience of politics in this life. I pray that this will never happen again in the future. 3) to pretend to be truthful to not “mixing Dharma with politics” – a feature NKT claims to possess and that forms the very nucleus of the NKT identity and the NKT pride to be “purer” than “degenerated” Tibetan Buddhism. In the following brief summary – Once and For All: Who’s Organizing the Protests? – Joanne Clark has kindly clarified the illogic nature of the claim that NKT is not behind the Anti Dalai Lama campaign. The UK protests are being organised by the New Kadampa Tradition, which emerged in the 1990s and now has nearly 50 centres in the UK promoting Shugden practices. This has caused something of an uproar within the Shugden community, who claim that while NKT members do participate in the protests, so do members of other Shugden worshipping groups– and that proves that the NKT don’t organize the protests. So what is the truth? First, as this article discloses clearly, there is no doubt whatsoever that the International Shugden Community (ISC) is an NKT organization. Given that all the leaders of the ISC are NKT teachers and senior members, it is only the name that distinguishes the ISC from being a mere branch of the NKT. Nonetheless, the NKT still claim that the two organizations are independent of each other– still claim that the NKT keep politics and dharma separate. However, they do struggle with keeping this boundary straight! For example, in 2014, the SOAS University of London held a conference on the Shugden controversy. Kelsang Rabten (AKA Nicholas Pitts) was one of the speakers. He introduced himself as a representative of the International Shugden Community. And he concluded his talk with a list of demands that the protesters would need the Dalai Lama to address before the protests would stop. So he was clearly identifying himself as an ISC leader, organizer of the protests. In fact, I came upon a discussion under the YouTube version of this conference in which someone commented on the fact that Rabten was a representative of the NKT. Rabten replied, “I’m not an NKT representative.” Whereupon the other commenter pointed out the label on the screen. Shortly afterwards, the comments were removed! Indeed, Rabten is a senior teacher in the NKT; he is resident teacher of the NKT HongKong Center. He is also spokesperson for the ISC, appearing in media outlets. So who does he represent? Why is such a fuss made to separate the ISC from the NKT? One of the dances he has made recently in order to separate the two is to change his name to Nicholas Pitts while representing the ISC and back again to Kelsang Rabten while teaching for the NKT! He wears a suit to represent the ISC and robes to represent the NKT. Is that honest? In fact, Rabten is not the only one struggling to keep his hats straight. As the following screenshots demonstrate, the Heruka Kadampa Meditation Centre (NKT Centre) and the ISC letterhead shown on one of the protest websites both sport the same address, 13 Woodstock Rd., Golders Green, London, NW11 8ES! There is no point in us [he and the Dalai Lama] meeting. He will reject what I say. He will never agree. Demonstrations are our only outlet. And in this interview that Kelsang Gyatso gave to Tricycle Magazine, published in Spring of 1998, he makes no effort to hide his and the NKT’s involvement in the protests, but speaks openly about his intentions regarding the protests. Ron Lister and his wife claimed to not to be members of the NKT, but merely “concerned Buddhists”. However, when I went to use the telephone in the hall, I noticed that the first number on their speed dial was for “Geshe-la”, as the devotees of Geshe Kelsang Gyatso call their guru; later I discovered that Ron and Ruth Lister had edited the first of Geshe Kelsang’s books to be published in English, and Geshe Kelsang himself told me that he had accompanied Ron Lister on his “fact-finding” tour round India to find evidence of the Dalai Lama’s alleged persecutions. Sadly, this sounds so familiar. It appears that the protests and the smear campaign against the Dalai Lama have been shrouded in a lack of transparency from their inception! And it also seems that what is relevant in that 1996 interview is relevant today. One can only wonder how many ISC leaders today might also have direct speed dial lines to Geshe-la– or his equivalent? … in October 1998 we decided to completely stop being involved in this Shugden issue because we realized that in reality this is a Tibetan political problem and not the problem of Buddhism in general or the NKT. We made our decision public at this time — everyone knows the NKT and myself completely stopped being involved in this Shugden issue at all levels. Unfortunately, the NKT did NOT stop being involved in “this Shugden issue at all levels.” So there is still confusion and trouble about that statement of Kelsang Gyatso’s. Perhaps in an effort to help mitigate all the confusion, the Western Shugden Society (WSS) was then created when the NKT decided they did, in fact, want to be involved in this Shugden issue again. The WSS became the official “organizer” of the 2008 round of protests. But that separation as well was not without disturbing ambivalence. In this letter from the Bodhisattva Buddhist Center, dated 6 September, 2008, and signed by resident teacher Kelsang Nyingpo, there seems to be no separation between the NKT and the WSS at all! And http://www.newkadampatruth.org for information about the NKT and our side of the story!! The ordained, although they have not taken ordination vows were sitting round tables watching videos of themselves at the demos! Attachment? Some told me they were prepared to use violence. Hatred? Why? Geshe-la wants us to win at all costs. Confusion? They have truly been poisoned. […] I found the whole thing quite perverse. G.K giving an empowerment of Avalokiteshvara while before and after festival gathering and organising his Stormtroopers to attack the Living Embodiment of Avalokiteshvara? For an individual to use such an important time in peoples lives to suit his own ignorance I found quite disturbing and sad. With His Holiness at least we have hope for the future. Yes, they are gathering forces for their all expenses paid trip to France. Not with my money, they aint! I’ve seen people going to demos (quite new to Dharma) with a literal string of criminal convictions to call HHDL a hypocrite and a liar. Who are the hypocrites? The NKT does nothing else for wider society: this is their whole raison d’etre to keep DS practise alive. This, folks, is their real ‘hidden’ agenda. Shameful. 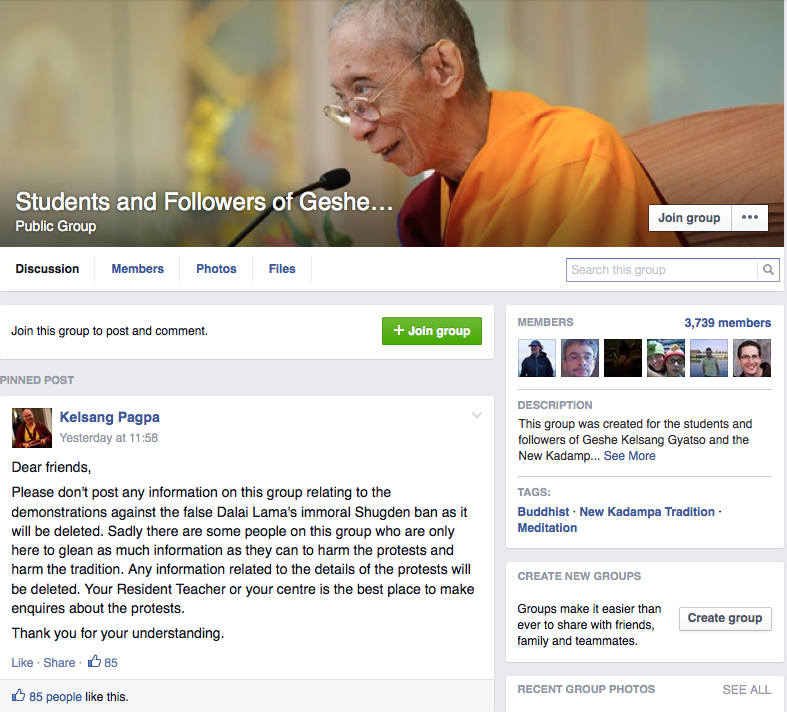 confirmed further at her happynkter webblog that Geshe Kelsang Gyatso is the initiator of the protests and views himself as the only remaining representative of Trijang Rinpoche. To stop this evil action, [of the Dalai Lama] as the representative of the Western Shugden Society, I personally will organise demonstrations against the Dalai Lama directly. I requested Kelsang Pema and Kelsang Thubchen to do this job for me and they have accepted. Kelsang Pagpa: There’s no question in Venerable Geshe-la’s mind that without the protests, Je Tsongkhapa’s tradition will be destroyed by the false Dalai Lama. That’s good enough for me and trumps any other considerations. Kelsang Pagpa It doesn’t matter what we think – it’s what Geshe-la sees that counts. I trust his judgement, everything else is secondary. What do I know? But most important of all, coming from a senior teacher of the NKT is this instruction that practice is not enough – we have to protest as well! We have to mix politics and dharma. Kelsang Pagpa: I think it’s a big misconception to think that all we have to do is keep our head down and keep practising and everything will be a-okay. Don’t you think that if that was the case the protests wouldn’t be necessary? Evelyn Tang: Janice Njoo Kelsang Pagpa in hong Kong we did have two special classes arranged before the protest. One is by Kelsang Rabten and one is hy Kelsang Tonglam. I guess you may request if you think your centre need one like this to dispel confusion. It seems that the ISC and the WSS are just figureheads, just ways to fool the public into believing that the NKT aren’t centrally involved in the protests. The ISC/WSS are something like telephone booths fitted with superman suits. NKT leaders, teachers and devoted followers hop into the booths and put on their ISC/WSS suits and then they shout “False Dalai Lama, stop lying” and go and speak to the press. Then they write outraged letters to the Guardian about any suggestion that the NKT might be organizing the protests. And this is the dance of subterfuge. This is all simply so that the NKT can tell their members, the public and other organizations that they are true to their mission of being non-political, of not mixing Dharma and politics – and have no role in organizing the demonstrations. I call this dishonest. I call the outcry now occurring in response to the Guardian news article dishonest. It’s time to simply come clear.